5 Delicious Reasons To Eat Breakfast & Shed Kilos! You get up, spring up to a new day, and gobble in a few bits and pieces of food and head off to any place that you need to go. It could be to school, office, some game or perhaps a long drive or whatever- that I could have missed out. Whatever be the reason- I will tell you in few words: YOU NEED BREAKFAST!! It is just not good, but necessary for all of us due o its unheard and super fascinating health research reasons. Let us go further and learn the right way to do the Brekkie! Enjoy Heavy Breakfasts Guilt-Free! Learn Why!!! Tip that you must know: Jog, hip hop, dance, skip or do the aerobics, but; yes , but You need to eat a good healthy breakfast before doing the workouts. 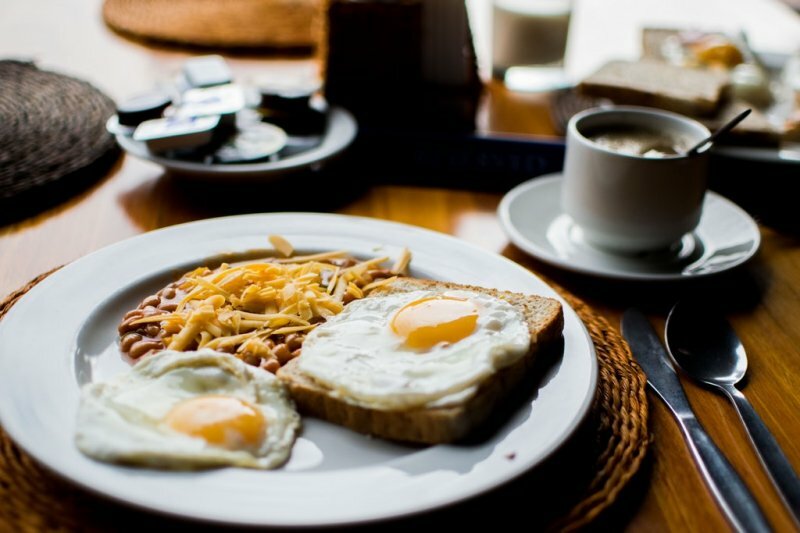 At the University of Bath , the researchers suggested that if a person eats breakfast before the morning workout session– it could act like a ‘primer’ to burn off the carbohydrates in a faster way. The experiments show that a breakfast help to burn more calories during exercise; than when you exercise without having a breakfast. It showed that when a person eats breakfast and then exercises about two hours later, it helps to metabolise the carbohydrates in the food eaten and also the process encourages to burn off the carbohydrate that is stored in the muscles. Tip that you must know: The Time that you et food is the deciding factor to melt down all that unwanted fat cells. So, what is the right time? Time your meals and follow it regularly. That can reduce the weight. At the University of Surrey , it had been noticed that if people eat normal foods- with no particular restrictions, but at a regular time on a daily basis- then this can help the body to reduce that excessive body fat. Not only did it reduce the fat, but the people could see a change (a positive one) in their discomforts related to diabetes, heart disease and that was indeed good. The advantage people never felt compelled to eat a particular diet. But they had to maintain strict timings for breakfast and other meals. High Energy Breakfast can slim you down! Tip that you must know: Give a high energy breakfast to children and adults of all ages. It should be rich in protein and that help in creating a good weight loss in the body. The research that was presented at The Endocrine Society showed that if a patient had obesity or maybe type 2 diabetes, they need to be careful about what they eat. But research shows that if the person eats a high energy breakfast, the food will beat out the problems of diabetes, weight loss and decrease the body’s need for excess insulin. If such a person eats 3 regular meals a day, which includes a grand, elaborate and healthy breakfast, a medium lunch and a light dinner; it shows that the energy will be well distributed in the body and there will be enough time to have a more organized diabetic control. So, if you a heavy meal in the morning, the body has more time to metabolize it throughout the day. But, if eaten at night, then the sugars will not burn away fast and that will cause fat to be stored under the cells. Tip that you must know: Breakfasts is always something kids put away during the school days. That could be because of last minute rushes, tension and even lack of time. So, try squeezing in more time for eating breakfast and that is bound to make them healthier, fresher and brighter. Recently, a research was conducted at the Virginia Techy mentioned about their concern for children who do not have breakfast. A survey was taken and it showed that lack of a proper breakfast made the youngsters dull over a period of time. On further research, parents and children were of the opinion that there was lack of time for breakfast and that is why- children often skip breakfast. So, an extra ten minutes were given to check the children. And yes, it did show improvement in their health, their memory power and even their overall well being. The research also showcased that the same amount of food will only be served- nothing more. Hence the issue of overweight will not rise. When children are fed with food inn the morning, it helps them burn the energy and fat for all mental and physical activities throughout the day. Tip that you must know: Who doesn’t love chocolates? Well, maybe a few, but most of us do love it. A new diet fad has emerged and that advocates a person can have dessert as part of the morning breakfast. So, enjoy those sweet delicacies in the name of thy health and live life happily! At the Tel Aviv University , a very interesting research came up and that did bring a smile on everyone who loved their desserts! So what was that about? An experiment was done on obese, non diabetic people. They were served a breakfast of about 600 calories. The people ate and their medical reports showed that they did reduce weight and in long term- the weight could be brought under control. The breakfast included carbohydrates and proteins, along with dessert. And this was a platter that would put away sweet psychological addictions right away with the morning breakfast. They could have cookies, cakes, chocolate along with their regular breakfast. They noticed that it had no negative impact on their body. In fact, they began to lose weight and their metabolism rates were even more systematic. In short, if the start of the day is kick started off with a lot of high energy and protein rich foods, this will help he body to control hunger and use this food- to produce enough energy for the rest of the day. So, the person can have lighter meals for the rest of the day without feeling the pang of hunger. Though the calorie count of the first meal of the day is high, since it is being evenly distributed for the entire day- the person will not have to face problems of obesity, indigestion or diabetes. Guess, these points would have shed some positive light on why you need to have your breakfast. Do not skip it any more!